Writer Jim Zub (Skullkickers, Samurai Jack) and artist Steven Cummings launched their hot Image series, Wayward a year ago and to celebrate its success, Zub has released the entire script for the first issue on his blog. It’s a great read, and a great blog, for those curious about the creative process of comics and those wanting to get a peek in to the industry. He’s very honest about the workings of the comci sbiz and his blog includes insights such as pitches and even sales figures. Great stuff. 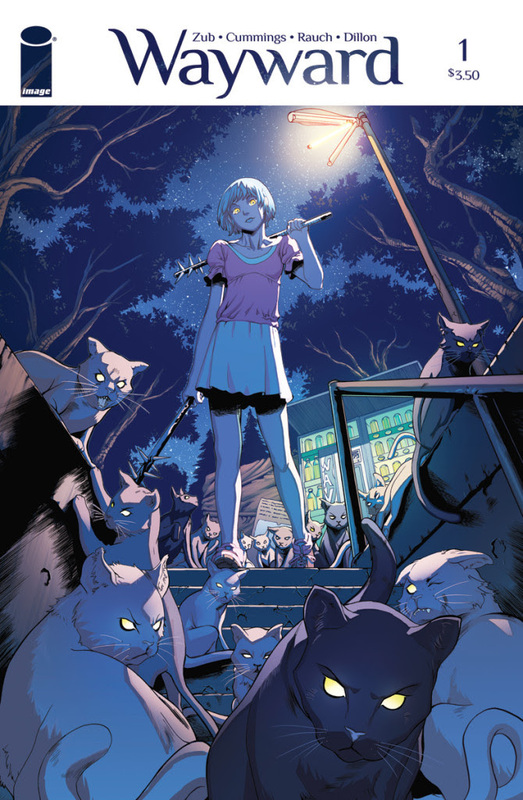 I tried to grab the first volume of Wayward from my local comic shop, but they regularly sell out, which is a good sign. I’ll be reading it when it arrives though, and if you haven’t read it yet either, the TPB of the first 5 issues is available now. Here’s the official description to whet your appetite. BUFFY THE VAMPIRE SLAYER FOR A NEW GENERATION! Rori Lane is trying to start a new life when she reunites with her mother in Japan, but ancient creatures lurking in the shadows of Tokyo sense something hidden deep within her, threatening everything she holds dear. Can Rori unlock the secrets of her power before it’s too late? JIM ZUB (SKULLKICKERS, Samurai Jack), STEVE CUMMINGS (Legends of the Dark Knight, Deadshot), and JOHN RAUCH (INVINCIBLE) team up to create an all-new Image supernatural spectacle that combines the camaraderie and emotion of Buffy the Vampire Slayer with the action and mystery of Hellboy. Don’t miss it!